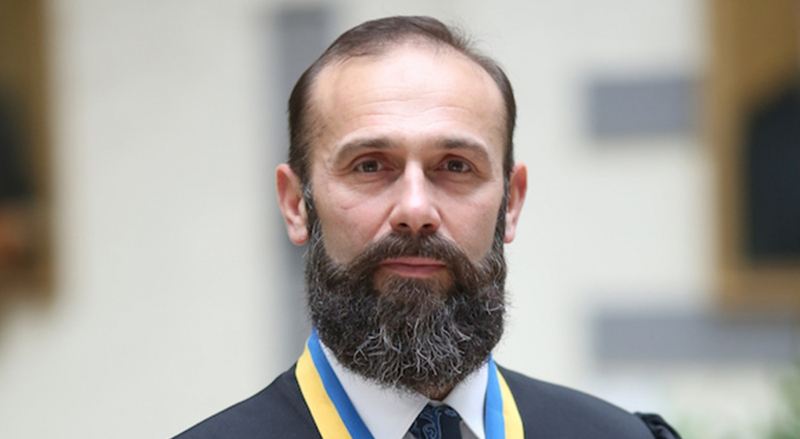 KIEV, Ukraine -- Ukrainian judge Artur Yemelianov has acknowledged in an online declaration that he owns a Breguet watch worth nearly a third of his annual salary and keeps piles of cash. On Jan. 12 he was suspended for three months after prosecutors opened a criminal case against him related to how commercial law cases were allocated to judges, according to statements by the Ukrainian High Council of Justice and Yemelianov himself. They accused him of rigging the process, which is supposed to be random, by setting out rules establishing that only particular judges could hear particular cases, court documents show. The prosecutors also claim that Yemelianov nudged the judges to deliver his preferred verdicts and would take judges off cases if they refused to comply. Ukraine is trying to show its international supporters and lenders that it can tackle entrenched corruption, including in the judiciary. The next payment of a $17.5 billion loan from the International Monetary Fund will depend on Kiev showing progress on reforms including anti-graft measures. Yemelianov denies any wrongdoing and says his businesswoman ex-wife gave him money that helped to fund his lifestyle. He says the allegations that he rigged the case allocation process were trumped up by his enemies in revenge for his attempts to stamp out bribe-taking and to stop him securing a seat at a newly established Supreme Court. His application could not be considered because of the criminal case against him. “The main goal was achieved - as soon as I was taken out of the running in the competition (for the Supreme Court),” he said earlier this month. The case is still ongoing and until it is closed, he is unable to travel abroad and his 1.5 million hryvnia ($56,944) bail money stays with the court. The prosecutors, according to their publicly available statements, opened the Yemelianov case after tip-offs from other judges. The prosecution service declined to comment on this story. The Ukrainian government, activists and anti-corruption officials have said the judiciary acts as a shield for corruption and distorts the business environment. The central bank complains that the judicial system has hampered its efforts to shut down banks it believes are engaged in nefarious practices such as money-laundering. It says that courts have given rulings that allowed 12 banks to stay open when they should have been closed, according to several central bank statements, most recently on May 11. "We are all living in the real world and are well aware that the judicial system is not clean, and bribery, and corruption and cronyism exist there," Justice Minister Pavlo Petrenko said in January. “The weakest link in our fight against corruption is the Ukrainian court,” Prime Minister Volodymyr Groysman said at a press conference in April. He was speaking shortly after Transparency International released figures showing that Ukraine ranked 131 out of 176 countries in the World Ranking of Corruption Perception. The government launched a drive to fight corruption last year under which judges and other public sector workers are required to detail their wealth in an online database. About 30 judges, with annual salaries ranging from $10,000-$13,000, own Porsches, according to their declaration for 2015 and others have big sums of cash. Yemelianov declared a 2015 salary of 226,181 hryvnias ($10,354), a watch costing 68,000 hryvnias ($2,588) and Blaser Repetierbuchse R8 Carbine worth 113,000 hryvnias ($5,173), and cash in hryvnias, euros and dollars worth the equivalent of $383,000, according the 2015 average rate. In 2013, his family income included 930,000 hryvnias ($35,392) in presents, prizes and wins. The wealth declarations of some of Ukraine’s most famous politicians and public officials have been pored over by the media and anti-corruption activists. If the prosecutors are right, Yemelianov and others judges have a pernicious influence on Ukraine’s business climate. Yemelianov says the prosecutors accused him of rigging thousands of cases but have not produced any evidence. He submitted his grievances to the European Court of Human Rights in April, and hopes the Court will take up his case and vindicate him. As part of the anti-corruption drive, the National Agency for the Prevention of Corruption (NAZK), which is responsible for checking the online declarations, is carrying out separate investigations into whether officials obtained the wealth they detailed honestly. An official at Ukraine's anti-corruption bureau NABU said it had also begun investigations into the declarations of judges but declined to name them or provide further details. The IMF has urged NAZK and NABU to work more closely together and said legislation must be passed by June to set up an anti-corruption court as a condition of its aid program, according to an IMF country report released in April. As well as the online data base, the setting up of a Supreme Court and anti-corruption court, Ukraine has removed judges' automatic immunity from prosecution and stripped lawmakers of the power to appoint judges. But Petrenko said it will be hard to reform the judiciary while judges have an interest in throwing out corruption cases against public officials to try and make sure other judges don't eventually turn the focus on them. "Will that judge take an objective decision? I think he will not, because he understands that he will open Pandora's box and this practice can be used against him," he said. Reformist officials and ministers in the Ukrainian state have complained their efforts to root out graft are resisted by MPs, ministers and officials who profit from the current system. "We feel the resistance of the old, unreformed system," Artem Sytnyk, the head of the NABU said. Yemelianov says the bulk of his recent income comes from his ex-wife, Svitlana Yemelianova, who is now in Vienna and gave him a 3 million hryvnia ($137,333) loan in 2015 to finance his travel expenses to see their three children. "She's a wealthy woman, she has this money, she earns as she did before. In order to regularly fly to see my daughter, I need to have the necessary money. My salary is not enough for this," he said. He says he was a successful lawyer until 2001. He says that his ex-wife became a wealthy businesswoman and psychologist in Donetsk, which has been under the control of Russian-backed separatists since an uprising erupted in 2014. She fled Donetsk as the fighting started and left behind most of the documents related to her firms, Yemelianov said. Efforts to reach Svitlana Yemelianova in Vienna were unsuccessful. Yemelianov declined to pass on her contact details. Yemelianov said he did not know any details of his wife's current businesses.